CAROL SANFORD has been the CEO of InterOctave, Inc., a global business resource to Fortune 500 and new economy businesses large and small, for over thirty years. In addition, Carol lectures at universities such as MIT Sloan School of Management, University of Washington Foster School of Business, and University of Michigan Ross School of Business on sustainability, business innovation, and corporate responsibility. Visit www.TheResponsibleBusiness.com for additional content and information. A Foreword from the Boardroom (Chad Holliday). A Foreword from Academia (Rebecca Henderson). Prologue: A New Business Mind. Procter & Gamble (P&G): Responsibility Prototype. 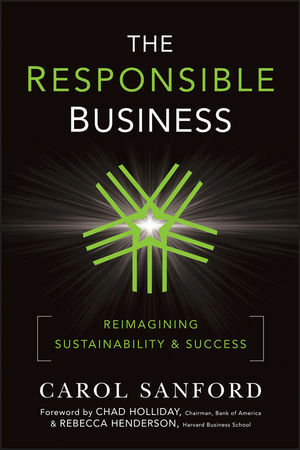 Evolve Corporate Responsibility by Evolving Business Responsibility. Three Forks in the Road to Responsibility. A Framework for the Responsible Business. From Add-on Responsibility to Full-on Responsibility. PART ONE: THE RESPONSIBLE BUSINESS: REIMAGINING BUSINESSES OF THE FUTURE. 1 Stories from Three Continents. Herban Feast: Caring for Customers. Colgate, South Africa: Localizing Identity and Destiny. Seventh Generation: Regenerating Planetary Systems. E. I. DuPont: Engaging Shareholder Value. 2 Stakeholders as Systemic Collaborators. Stand in the Stakeholder's Shoes. Five Key Stakeholders and Their Stakes. 3 Geometry of the Responsible Business. The Logic of the Pentad. 4 Be Value-Adding, Not Value-Added. Energize Caring Through Value-Adding Processes. 5 Making the Responsible Business Pentad Work. Revolutionizing Business Models: Red Hat. From Commodity to Nondisplaceability: Kingsford. Deeply Connect to Your Customer: Herban Feast. Mission-Driven Meets Future-Proof: Seventh Generation. Change the World by Changing the Business: Colgate, South Africa. PART TWO: MAKING I T WORK: THE MAP TO THE TERRITORY. 6 Teaching an Organization to Star. Retrofi t an Existing Business. Reverse Phases for a Start-up Responsible Business. Self-Organizing Decision Making Is Responsible. PART THREE: IRRESPONSIBILITY HAPPENS: REFRAMING HOW CHANGE WORKS. Running Faster in the Wrong Direction. From Backward to Forward Spin. 9 Our Own Worst Enemies: Turning People Around. Familiarity Is the Enemy of Creativity. Narrower Frames of Reference Cause the Pentad to Spin Backward. Leading from the Purposeful Mental Frame. Personal Development and Critical Thinking Skills. 10 Cautionary Tales: Design for Prevention and Cure. PART FOUR: THE BIG PICTURE OF RESPONSIBILITY. 11 A Responsible View of Capital. Stakeholder Return on Investment (ROI). 13 The Future of Responsibility. Responsible Investing Within the Current Legal Framework. Epilogue: Developing Capability for Responsibility.